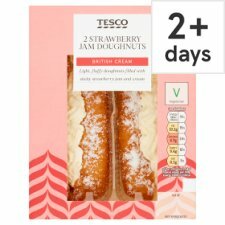 2 Doughnuts filled with stabilised cream and strawberry jam. British Cream. Light, fluffy doughnuts filled with sticky strawberry jam and cream. Also, may contain peanuts and nuts.. For allergens, including cereals containing gluten, see ingredients in bold. INGREDIENTS: Wheat Flour (Wheat Flour, Calcium Carbonate, Iron, Niacin, Thiamin), Cream (Milk) (24%), Strawberry Jam (16%) [Glucose-Fructose Syrup, Strawberry Purée, Gelling Agent (Pectin), Concentrated Lemon Juice], Water, Pasteurised Egg, Palm Oil, Rapeseed Oil, Sugar, Dextrose, Cornflour, Yeast, Emulsifiers (Mono- and Di-Glycerides of Fatty Acids, Sodium Stearoyl-2-Lactylate, Mono- and Di-Acetyl Tartaric Acid Esters of Mono- and Di-Glycerides of Fatty Acids), Raising Agents (Disodium Diphosphate, Sodium Bicarbonate), Milk Proteins, Wheat Starch, Salt, Stabilisers (Carboxymethylcellulose, Pectin), Soya Flour, Flour Treatment Agent (Ascorbic Acid). Once opened consume within 24 hours and by 'use by' date shown.